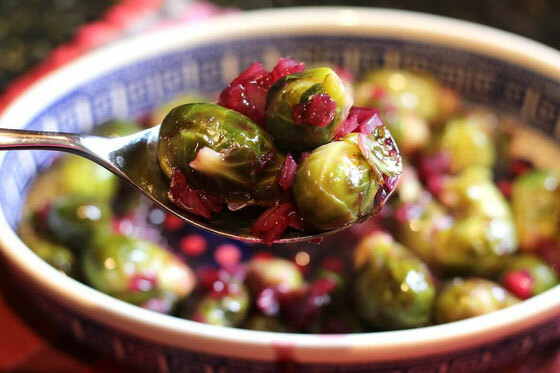 Grape juice adds a wonderful sweetness to this Brussels Sprouts recipe. This heart-healthy dish is sure to wow your tastebuds. Disclosure: This post is sponsored by Welch's. All opinions are my own, as always! As a registered dietitian nutritionist, I love adding unique flavor to veggies to make them even more appealing. 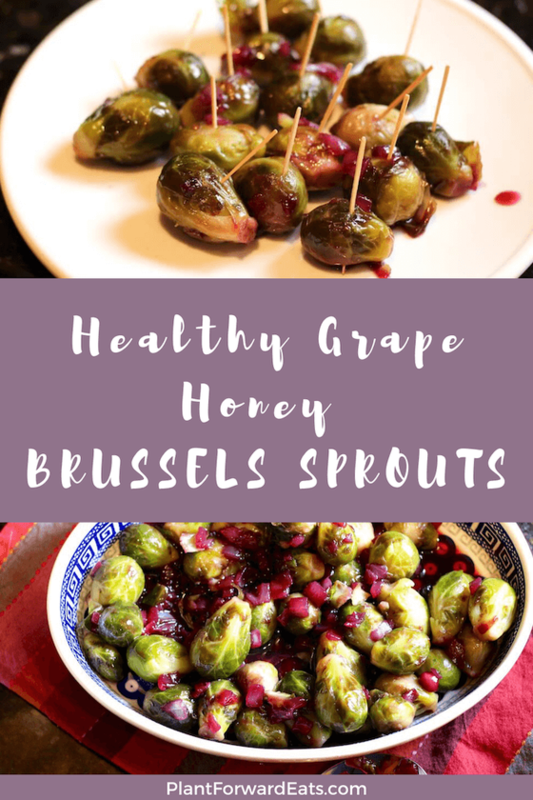 I've been in the mood for Brussels Sprouts lately, and I've also been playing around with cooking with Welch's 100% Grape Juice. So I thought that the two ingredients would be fun to combine. Did you know that Welch's grape juice is made with Concord grapes? These grapes contain powerhouse nutrients called polyphenols and help keep your heart healthy by promoting healthy circulation. Because Concord grapes are only available fresh for a short time every fall, the grape juice is a great way to take in the nutrient-rich fruit. Each cup of the grape juice provides two servings of fruit. I decided to make a delicious glaze with the grape juice. I first diced and cooked onion; then I added grape juice, as well as corn starch to thicken the mixture, and a little honey to sweeten and thicken it. The juice is a great way to provide sweetness without adding sugar (and with the amount of honey I used in the glaze, you take in just 3/4 teaspoon added sugar per serving). Once I finished cooking the glaze, I mixed it with the Brussels sprouts. Then I ate a bunch of Brussels sprouts. How could I resist? I mean, this dish is pretty delicious! Because it's game-day season, I thought it would also be fun to give an option for serving the Brussels sprouts as finger-food appetizers. Simply skewer each Brussels sprout with a toothpick. Making this platter took seconds, and your guests are sure to be appreciate a healthy app like this one. The best part? This recipe meets the American Heart Association's guidelines for heart-healthy recipes. Plus, each serving provides 24 percent of the daily value for cholesterol-helping fiber and 17 percent of the daily value for potassium, a mineral that can help control blood pressure by counteracting the effects of sodium. What are you waiting for? 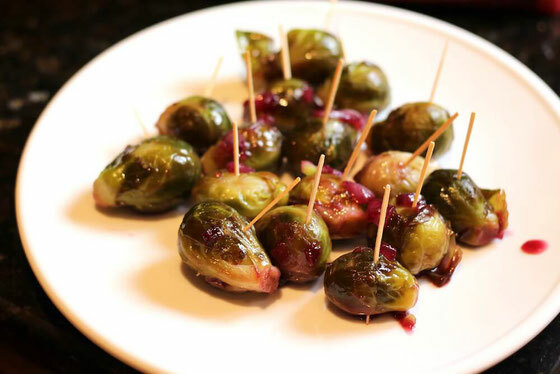 Go ahead and dig into this delish Brussels sprouts recipe! I can't wait to hear what you think. If you're looking for other ways to cook with grape juice, here's how to make healthy salad dressing with grape juice. Heat 1/4 cup water in a small saucepan over medium high heat. Add onion, and cook until translucent and most of the water is absorbed, 3-4 minutes; stir occasionally. Add grape juice, corn starch, and honey to the onions; bring to a boil and stir frequently as mixture thickens, 3-5 minutes. Meanwhile, cook Brussels sprouts according to package directions in a medium saucepan, using as little water as possible. Once cooked, drain any remaining water (if any) and toss with grape glaze. Serve immediately. Serves 4. What are your thoughts on this topic? What's your favorite way to enjoy grape juice? What are your tips for cooking with juice?